Usually a pregnancy which completes 40 weeks, and the baby born thereafter , is known to be a mature baby, having weight of approximately 2.50 Kg to 3.00 Kg at the time of birth. In an extreme unusual case, where a child is born 28 weeks before time, it is called “ Extreme Prematurity” , and the weight of the baby at the time of birth, if less than 1 kg, is considered as “ Extremely low birth weight baby”. In such cases, the child is very vulnerable and is prone to getting breathing problems, low body temperature, jaundice, blood loss, convulsions, intestinal inflammation, indigestion of feed, and many more such complications, that could be fatal. But in today’s advanced and skilled Neonatal ICU Care, latest technology and equipments, and experienced team of doctors & care takers, survival is possible. A similar such case came to Isha Hospital. 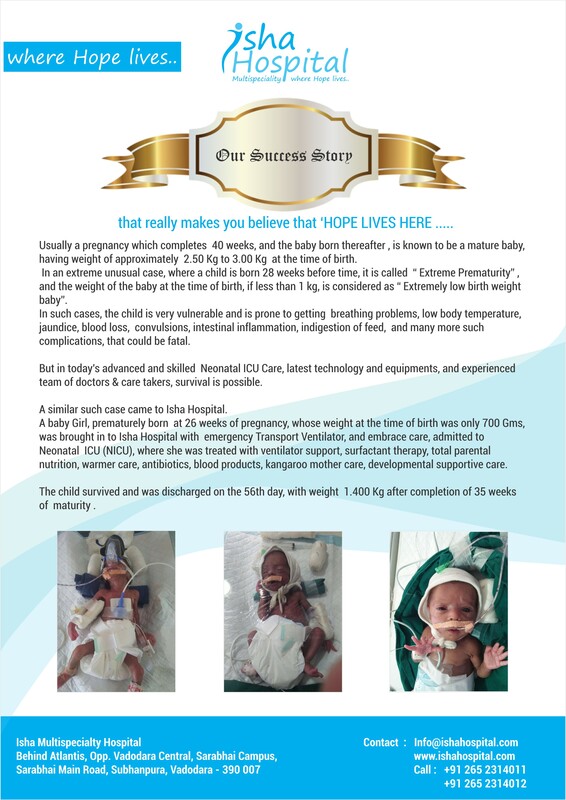 A baby Girl, prematurely born at 26 weeks of pregnancy, whose weight at the time of birth was only 700 Gms, was brought in to Isha Hospital with emergency Transport Ventilator, and embrace care, admitted to Neonatal ICU (NICU), where she was treated with ventilator support, surfactant therapy, total parental nutrition, warmer care, antibiotics, blood products, kangaroo mother care, developmental supportive care. The child survived and was discharged on the 56th day, with weight 1.400 Kg after completion of 35 weeks of maturity .